The Great American Cleanup, Keep America Beautifulâ&#x20AC;&#x2122;s signature program, organizes millions of volunteers in locally-directed activities that encourage individual stewardship for the environment and care for the community. Efforts in litter prevention and removal, waste reduction, recycling, beautification and community greening result in cleaner, greener, safer and more beautiful public spaces. Dear Great American Cleanup Friends and Supporters, Each and every day, Keep America Beautiful is singularly focused on building beautiful places in communities across the country. Whether the place is a neighborhood park, a nature trail, a river shoreline or a vacant lot, public places provide a space where people can come together, share ideas and establish meaningful relationships. When provided the right tools and resources, we’ve found that people tend to take better care of these places, resulting in even greater benefits. For example, we know that public places affect our sense of self, our connectedness to others, and our belonging to a community. At Keep America Beautiful, it’s our mission to engage individuals to take greater responsibility for improving their community’s environment. and greening of a vacant lot can increase adjacent property values by 30 percent. Community gardens have been proven to increase property values while providing opportunities for physical activity, healthier eating and better nutrition. During the 2012 Great American Cleanup, we’re proud to report that our volunteers’ work returned nearly $230 million in measurable benefits across 20,000 communities. It’s clear. Through our actions, we help create communities that are socially connected, environmentally healthy and economically sound. We want to acknowledge our affiliates, our partners, our national sponsors, and our volunteers who all made a significant contribution to creating beautiful places in communities across America. We hope you enjoy reading about their remarkable good work. With a strong national network of affiliates and partners, including state recycling organizations, we work with millions of volunteers who take action to build and sustain vibrant communities. We’re looking forward to an even more successful 2013 Great American Cleanup with greater participation and far-reaching impact than ever before. 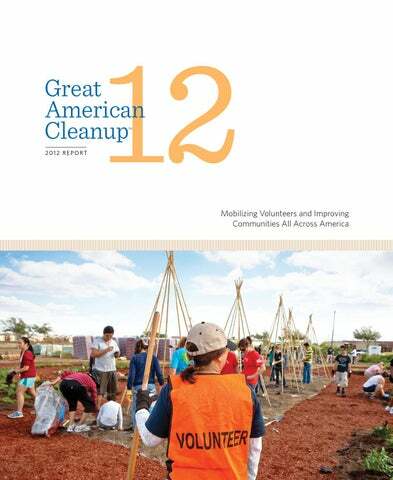 In 2012, together with our connected network, we recruited 4.2 million volunteers to participate in the Great American Cleanup, the nation’s largest community improvement program. From litter cleanups, tree plantings and disaster restoration projects to vacant lot greening, classroom programs, recycling initiatives and community gardens, we delivered positive and sustainable impact in communities across the country. Dancing with the Stars’ Karina Smirnoff planting flowers. Each of the KAB affiliates in the featured locations led large-scale cleanups and other coordinated events with significant community impact. Volunteers cleaned up litter and illegal dump sites, hosted recycling events, painted out graffiti, and planted thousands of flowers, plants and trees. planted trees, cleaned and planted gardens and removed invasive species along the Fall Creek waterway in the pouring rain, addressing targeted areas on the city’s Quality of Life Plan. And a number of skateboarders, participating in the 2012 Indianapolis GreenSkate, picked up trash and other debris as they skateboarded around the city. Los Angeles Mayor Antonio Villaraigosa kicked off the National Day of Action in L.A. with nearly 3,500 volunteers cleaning up several sites along the L.A. River. The volunteers removed 39,700 pounds of litter and debris, and remediated 70 graffiti-laden sites. Keep Los Angeles Beautiful was joined by the Friends of the L.A. River to clean up 10 sites along the river, focusing on areas with natural bottoms that tend to trap much more litter and debris. Not to be outdone by Mayor Villaraigosa, Oakland Mayor Jean Quan joined KAB President & CEO Matt McKenna at Keep Oakland Beautiful’s beautification event in East Oakland as part of the Mayor’s “100-Block Community Initiative” to reduce violence. This area represents 5 percent of the city’s land mass, but experiences the city’s majority of crime. More than 500 volunteers helped to pick up litter, weed and mulch, and prune the 33 blocks along the Bancroft Median. The volunteers completed another sizable project by building raised planter beds at Verdese Carter Park for residents to grow food, and they planted fruit and ornamental trees at East Oakland’s PRIDE Elementary School. Keep California Beautiful President Leonard Robinson, KAB President/CEO Matt McKenna, KCB Executive Director Christine Flowers. project. Kicked off by Mayor Michael A. Nutter—KAB’s 2011 Vision for America Award recipient—volunteers painted the Center as well as the surrounding benches, fences and playground surface. They restored the basketball court backboards and planted fresh sunflowers and garden beds around the Center. Shreveport Green in Shreveport, La., engaged 250 volunteers, including members of its City Council and local firefighters and policemen, to clean approximately five miles of streets and an illegal dump site. Shreveport Green took on Texas Avenue, a historic but neglected part of the downtown, and they refreshed the Mercy Center and built a raised garden bed there. There were many additional highlights throughout the country, above and beyond the 10 featured events. Keep Rio Rancho (N.M.) Beautiful engaged more than 1,000 volunteers to beautify its community; I Love A Clean San Diego rallied 5,300 volunteers to its annual “Creek to Bay” cleanup; Keep Highlands County (Fla.) Beautiful gathered volunteers to clean several inaccessible canals using boats; and Keep Clarke County (Ohio) Beautiful beautified 30 blocks of downtown Springfield. 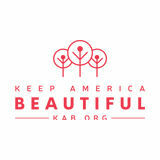 Keep America Beautiful will host the second annual National Day of Action on Saturday, April 6, 2013. Applauding a Greener NYC Keep New York City Beautiful Coalition Celebrates Earth Day in Times Square Keep America Beautiful celebrated New York City’s sustainability efforts with a rally in Times Square during the 2012 Great American Cleanup. The annual event, which celebrates National Volunteer Week and Earth Day, also saw New York City and Mayor Michael R. Bloomberg receiving the first-ever “Green City Award” from Keep America Beautiful. The kickoff also served as the fifth anniversary of Mayor Bloomberg’s plaNYC and the ninth year Times Square celebration of the Keep New York City Beautiful coalition (KNYCB). The event provided a platform for KNYCB— an organization of city agencies and nonprofits—to launch its participation in KAB’s GAC. The event featured performances by Miss America 2012 Laura Kaeppeler, cast members of Broadway’s MAMMA MIA! and STOMP!, as well as the pop group Mustard Seed Magic, who all entertained the crowd, while speakers touted the city’s sustainability efforts, cleanliness and volunteer spirit. New York resident Brenda Duchene was honored with a President’s Volunteer Service Award, recognizing her long history of volunteerism, most notably her intergenerational efforts to improve the Powell Street Community Garden through a grant from Change By Us. Students from NYC’s High School for Environmental Studies. (From left) Miss America 2012 Laura Kaeppeler and PVSA winner Brenda Duchene with Olivia Ferriter, Acting Director, Office of Youth, Partnerships & Service, U.S. Department of the Interior. John Taylor, Vice President, Public Affairs and Communications, LG Electronics USA, presents donation to Keep NYC Beautiful chairman and NYC Sanitation Commissioner John Doherty. Cleanups are Just the Beginning The Great American Cleanup originally began as a litter cleanup initiative designed to aesthetically improve the environment by creating more inviting parks, streetscapes and public spaces. As the program has matured and grown, grassroots organizations have taken on more diverse challenges—eliminating graffiti, collecting recyclables, planting community gardens, and hosting educational events. But community cleanups remain at the very heart of the event, and the results are staggering. In 2012 alone, 87 million pounds of litter and debris were collected by volunteers throughout the country. Gwinnett Clean & Beautiful has hosted the Great American Cleanup Gwinnett Challenge since 1999 and has witnessed steady growth every year. This year’s event had more than 40 groups and organizations participating. Each group designed its own project in one of seven different categories in the hope of becoming a 2012 Challenge Winner. One winner was selected from each category and awarded a $500 cash prize for making the biggest transformation and impact on his or her neighborhood and community. Categories included the Green-up Your Neighborhood Award, the Stash the Trash Award, the Beautify Your Space Award, the Put Litter in Place Award, the Recycle Now Award, the Wipeout Graffiti Award, and the Grow Green Award. Primerica, the Wipeout Graffiti winner, painted more than 660 feet of fencing to remove old graffiti. Its effort helped to beautify a neighborhood entrance and will discourage future graffiti vandalism along Old Norcross Road. The Grow Green winner, Keller Williams Realty Atlanta Partners, built and planted three vegetable and flower gardens at Sheltering Arms. Children at this facility care for the gardens and are producing vegetables for use at the Daycare Center. The Recycle Now winner, Teacher’s As Leaders, collected more than 1,100 books to give to children being treated at Gwinnett Medical Center. Thanks to this project, the children receive a free book when they check out of the hospital. These were three examples of the many creative projects conducted in Gwinnett County that took place during the 2012 Great American Cleanup. From March 1 through May 31, 2012, more than 15,000 people participated in 247 projects for Gwinnett Clean & Beautiful’s Great American Cleanup. Together, volunteers were successful in collecting more than 1 million pounds of recyclables; removing more than 80,700 pounds of litter, trash and debris; painting one mile of fencing; and cleaning up 195 miles of roadway. volunteers and 20 sponsors came out in support of the community, which has recently provided the school with the funds for a new football stadium. The high school students completed jobs that ranged from cleaning out flower beds to cleaning up debris to painting houses for 112 residents. The last event that took place was a massive tire collection in the southern part of the county. As a collective effort, five city sites gathered 12,000 tires in a matter of hours and an additional 6,000 tires were collected over the next week, totaling 18,000 tires. This event kept city and county ditches from becoming illegal dump sites. In total, Keep Angleton Beautiful’s impressive set of projects resulted in 33,632 pounds of trash and debris being collected. “Our main goal was educating people so we don’t have to go back and do more cleanups,” Katie Glass, KPCB’s executive director, told The Ledger. Glass continued to emphasize how important it was to provide the community with valuable information about waste and recycling to prevent the need for cleanups in the future. I Love A Clean San Diego (ILACSD) typically conducts approximately 90 cleanup events each year. This year, ILACSD focused on a new location in need of tidying up executing its first on/off ramp cleanup during the Great American Cleanup. I Love A Clean San Diego partnered with the California Department of Transportation (Caltrans) to host ILACSD’s Creek to Bay Cleanup at Camelot Canyon in the University Heights neighborhood of San Diego. Adult volunteers received full training about how to conduct a highway cleanup and were also given hard hats, goggles, and safety vests. During the event, 32 volunteers successfully removed 1,200 pounds of trash. While the trash that was picked up did not include any large debris, there were “bags and bags of litter,” making the on/off ramps shine. “We hope to continue to target on and off ramps with Caltrans because we had been getting a lot of complaints from people about them,” said Natalie Roberts, I Love A Clean San Diego’s director of community events. Keep Pennsylvania Beautiful has 100% Statewide Participation The Great American Cleanup of Pennsylvania is the state’s premier community improvement event. Keep Pennsylvania Beautiful held its annual “Pick It Up PA Day” with a very impressive participation rate. In 2012, all 67 counties in Pennsylvania were represented in the Great American Cleanup of Pennsylvania! “Pick It Up PA Day” takes place annually for two weeks around Earth Day. During this promotional period, registered event coordinators can gain access to using landfill space for free at participating landfills, transfer stations, and waste-to-energy facilities. The Great American Cleanup of PA website provides a countyby-county list of participating landfills so that registered event organizers can easily find the nearest landfill. The website also has a reporting page so all cleanups have an opportunity to report their results. Hawaii, Oklahoma, Pennsylvania and Tennessee had 100% county-by-county volunteer participation! A total of 4,421 events took place with 141,264 volunteers collecting 338,148 bags of trash, the equivalent of nearly 6.8 million pounds. Volunteers also cleaned 13,589 miles of roads, railroad tracks, trails, waterways and shorelines, as well as slightly more than 14,000 acres of parks and wetlands. Additionally, volunteers planted more than 22,500 trees, bulbs and plants in an effort to keep Pennsylvania beautiful. OKC Beautiful’s Annual Litter Blitz OKC Beautiful has organized litter pick-up events since its inception in 1962 and it’s hosted the annual “LitterBlitz,” as a formal program, beginning in 2000 as part of the Great American Cleanup. “LitterBlitz” is six-week, anti-litter campaign organized to curb litter and create community awareness of this ever-present problem. Beginning in late March and ending in early May, volunteer groups gathered to pick up trash throughout Oklahoma City. The 2012 LitterBlitz kicked off at the highest point in Oklahoma City—the Oklahoma City Landfill! Through “LitterBlitz,” OKC Beautiful volunteers have increased to 11,000 annually, and they picked up an astounding 60 tons of trash in 2012. It’s estimated that volunteers have removed over 50,000 tons of trash in parks, medians and roadways. In addition to litter cleanups, volunteers painted park trash cans, playground equipment and spread mountains of mulch in the parks. pollutants and stabilize the shoreline as well as create a rain garden. Volunteers from a local VFW helped to clean up the shoreline, campsites and a fishing pier at Chickahominy Riverfront Part in a beautification of the Ironbound Square. Members of the military service were the major participants in GAC activities in Newport News. Among the many activities service members participated were installing mulch at two playgrounds, and improvements of a park landscape, elementary school grounds and the public schools support center. The municipal parks in Norfolk received a makeover with volunteers painting picnic shelters, fencing, picnic table and benches at Northside Park, Barraud Park, Lafayette Park, Lakewood Park and Ocean View Park. Volunteers from the USS Harry S. Truman helped construct climbing and play structures for the Virginia Zoo’s Asian Su and Moon bears and bearcats. And 20 civic groups from across the city helped to pick up litter at 20 different sites. nationwide community cleanup effort. The mosaics were auctioned during the “Mess to Masterpiece Auction, Presented by Glad® Black Bag” on eBay from April 16-26, 2012, to support KAB’s Great American Cleanup, in addition to the millions of Glad® ForceFlex® Black Bags that have been donated to cleanups nationwide. When millions of volunteers gather to pick up litter and other debris from roadways, highways and waterways over a three-month period, where does all of the waste go? Without the help of haulers and recyclers such as Waste Management, the nation’s largest recycler of municipal solid waste, the Great American Cleanup wouldn’t be able to achieve its mission. Waste Management’s support of the Great American Cleanup was integral to the success of the program in 2012. This year, 15 Keep America Beautiful affiliates were awarded “Think Green” Grants to be used for the Great American Cleanup (GAC) projects. Waste Management partnered with Keep Oakland Beautiful to complete a gardening project as part of the GAC 2012 National Day of Action on April 28. More than 500 volunteers helped mulch, weed, prune and pick up litter along 33 blocks of the 50-foot wide Bancroft Median in East Oakland. Volunteers also built raised planter beds, which will enable residents to grow food at the Verdese Carter Park. In addition to the planter beds, volunteers also planted fruit and ornamental trees at the East Oakland PRIDE Elementary School. Another event, supported by a “Think Green” grant, took place in Avenal, Calif., on the National Day of Action. Kettleman Elementary School’s students participated in a community cleanup along Highway 41 and the two blocks around the school. The project served as a great tool to teach the children about the importance of not littering. In addition, they painted the interior of a building for the new Kettleman City Chamber of Commerce. Further south in California, more than 80 volunteers came out to participate in the annual Temescal Valley Great American Cleanup. Local residents, ranging from children to adults, discarded 16,000 pounds of trash and debris from the Lake Mathews region. This year, volunteers expanded their cleanup efforts to open space around Lake Mathews, addressing the litter found at illegal shooting ranges located four miles from Temescal Valley homes. with the Charlotte County Family Services Center, Team Port Charlotte, and a Boy Scout working on his Eagle Scout badge. The grant also provided a storage shed for the community garden at the Charlotte South County Park. Also in Florida, Waste Management supported Keep Clay Beautiful’s St. Johns River Cleanup and encouraged attendees at Clay County Agricultural Fair to recycle. Keep Palm Beach County Beautiful completed two projects with the help of its “Think Green” GAC Grant. Volunteers gathered in the Town of Juno Beach to plant 2,555 sea oats on the beach and collect 400 pounds of litter. The grant also helped repair a boat ramp in the Town of Lake Clarke Shores that will allow boaters to access Lake Clarke. In addition to the ramp, the grant helped fund the installation of recycling receptacles at the lake. Keep Marietta (Ga.) Beautiful engaged community members and local service groups to transform a portion of an overgrown and unused playground at the Head Start School into a community and school garden. Keep it Moving in Detroit hosted a community banquet at the Mount Cavalry Baptist Church. The guest speaker at the event was Bettie Mencheck from the Department of Education and the Master of Ceremonies was Brian Conaway of Waste Management, Southeast Michigan and Ohio. The following morning, Keep It Moving kicked off its community cleanup at Pingree Park. Keep Our Coast Beautiful and Harrison County Beautification in Gulfport, Miss., worked together on their annual “Bring It!” household waste collection. Their “Think Green” GAC Grant helped them place Big Belly solar compacting trash containers in downtown Gulfport. It All Comes Back to You: Reduce, Reuse and Recycle Recycling is the easiest thing that any individual can do—every single day—to conserve energy, reduce carbon emissions, and protect our treasured natural resources. Keep America Beautiful, and the Great American Cleanup, strive to motivate more Americans to reduce, reuse and recycle more of their waste. By promoting simple, everyday choices and actions, and by inspiring participation, our 2012 effort resulted in significant recycling results. Great American Cleanup National Sponsors LG Electronics and Waste Management teamed up with Keep Oklahoma Beautiful and the City of Oklahoma City to host a very successful eCycling event in early May. The Great American Cleanup event took place at the Oklahoma State Fairgrounds and was made available to all Oklahomans. As advertised, the eCycling event was quick, simple and absolutely free. On the day of the event, vehicles loaded with materials to be recycled began arriving around 7:30 a.m., with the last vehicle pulling through the drop-off area at 4:30 p.m. Volunteers removed all acceptable electronic products from trunks or pickup beds–most participants didn’t even have to get out of their cars! The event collected items from 1,055 cars and trucks, which generated 10 full semi-truck loads of electronic waste. It was calculated that the quantity of recycled materials is equivalent to the amount of solid waste generated by 362 U.S. households in one year. Keep Oklahoma Beautiful’s eCycling event netted 746,767 pounds of mixed office electronics, which were diverted from landfills and properly recycled. This Great American Cleanup event is part of the LG Electronics Recycling Program, which is designed to provide consumers with a convenient way to dispose of their used, unwanted, obsolete or damaged consumer electronics products. According to Wayne Park, president and CEO, LG Electronics USA, LG collected more than 10 million pounds of unused electronics for recycling in 2011. Keep Fort Worth Beautiful Hosts Successful Composting Class Each year, Keep Fort Worth (Texas) Beautiful hosts a Master Composter Class for local residents and others during the Great American Cleanup. The program started at Seattle Tilth, an educational nonprofit that provides information and resources about composting and organic gardening, among other topics, and came to Texas about 15 years ago. Since then, all classes have been filled to capacity. The 16-hour course is taught by Larry Wilhelm, a state-recognized instructor. While most of the course takes place in the classroom, participants are required to complete 20 hours of volunteer time to obtain the title of a Master Composter. Participants learned extensively about organic composting, how to conduct backyard composting and vermicomposting, as well as proper recycling methods. Many participants were organic gardeners who aspire to live organically, while others were simply interested in composting at home. “They take their knowledge to help keep things out of the landfill,” said Keep Fort Worth Beautiful Executive Director Debbie Branch. “It’s a win-win.” All attendees also received “The Rodale Book of Composting” and a Shepherd Complete Composter. Did You Know? A glass container can go from recycling bin to a store shelf in as few as 30 days. For over 90 years, the City of Cincinnati has celebrated the “Cincinnati Reds’ Opening Day” with a huge parade through the streets around Findlay Market. Thousands of people from around the tri-state area join in and, this year, Keep Cincinnati Beautiful (KCB) used the parade as an opportunity to promote the Great American Cleanup. In a very resourceful recycling effort, KCB volunteers made a Reds’ hat out of recycled plastic grocery bags and cut “home plate” signs out of reclaimed plywood. These creative projects connected well with the Findlay Market Opening Day Parade and KCB’s parade theme—“Taking care of our home base.”—which helped to raise awareness of the work KCB does in the community. The effort must have sparked some inspiration because more than 7,500 volunteers from 110 communities and schools participated in KCB’s Great American Cleanup activities. Two weeks after the parade, KCB hosted an e-waste collection event. KCB partnered with Whole Foods and 2TRG (a local electronics recycler) to collect old computers, TVs, cell phones, printers, monitors, and more. Despite the pouring rain, volunteers still managed to collect over 10,000 pounds of e-waste. This contributed to the 10 million pounds of electronic waste that was collected for recycling during the 2012 Great American Cleanup. Keep Florence Beautiful adds Paper Shredding and Paint Collection This year, in addition to Keep Florence (S.C.) Beautiful’s traditional Great American Cleanup litter cleanup event, KFB added two unique recycling activities, including paper shredding and a latex paint collection. In total, 1,679 pounds of paper were collected, shredded and recycled at the Great American Cleanup headquarters in Florence County. Recycling services are limited in Florence County and the availability of paper shredding provided residents with secure document destruction and an environmentally-friendly alternative to disposing of the paper waste in the local landfill. In addition to the shredding project, 116 containers of latex paint were collected and sent to be re-manufactured through “The Paint Exchange” as a result of this special collection activity. “The Paint Exchange” collection provided residents with a much-needed service because paint is not accepted at Florence County Convenience Centers. This proper disposal method is important because it protects aquatic life from the toxins of latex paint, while maintaining water quality. Expanding the GAC to include environmentally-friendly disposal options enabled Keep Florence Beautiful to reach a broader audience and engage more citizens in taking responsibility for their community. Nestlé ® Pure Life® Contest Spurs PET Recycling More than 190 million PET (plastic) bottles were recycling during the 2012 Great American Cleanup, another significant recycling highlight for GAC volunteers across the country. 485,000 pounds of PET water bottles were recycled. Keep Stockwell (Ind.) Beautiful, KAB’s smallest affiliate with a population of nearly 550 people, received the award in the small population category for recycling 35,307 pounds, or 64.78 pounds per capita, of PET in 2012. Solo Cup Provides Grants for Recycling Programs Solo Cup Company, in its fourth year as a National Sponsor of the Great American Cleanup, presented seven Keep America Beautiful affiliates with its Foodservice Packaging End-of-Life Education Grants during the 2012 GAC. “KAB affiliates, with their dedicated grassroots volunteer base, are in a perfect position to tailor programs specific to their communities’ needs,” said Kim Frankovich, vice president of sustainability at Solo. “Their hands-on approach to making a difference in their communities helps us spread the word about proper foodservice packaging disposal options. “These grants will expand existing programs or develop new ones to educate and promote awareness about proper end-of-life options for our products. More and more communities are expanding recycling and composting options for the paper, plastic and compostable products we make,” added Frankovich. Recipients of the grants included Keep Yankton (S.D.) Beautiful, Montgomery (Ala.) Clean City Commission, Keep Oak Park (Ill.) Beautiful, Keep Knoxville (Tenn.) Beautiful, Keep Philadelphia Beautiful, Keep Cincinnati Beautiful and Keep Cocke County Beautiful in Newport, Tenn. Participating affiliates were challenged to create proposals for educating community members about the harmful effects of littering foodservice packaging as well as for teaching the correct disposal options, including recycling and composting, for foodservice packaging where available. The affiliates’ projects were implemented during 2012 with results to be reported in the spring of 2013. The creativity and scope of the projects varied widely. For example, Keep Cincinnati Beautiful partnered with the Cincinnati Zoo to educate elementary students about the environment and proper waste disposal. The Montgomery Clean City Commission installed waste and recycling containers throughout local schools and developed a school-based awareness program about waste disposal options. Keep Yankton Beautiful also purchased waste and recycling containers for a local high school and plans on educating incoming students on proper waste disposal. Another project oriented to education was developed by Keep Oak Park Beautiful, which is educating community members and local businesses about an existing program that collects food scraps, compostable paper and yardwaste for composting. A number of affiliate programs are focusing on public spaces and festivals. Keep Philadelphia Beautiful used its grant to purchase and distribute environmentallypreferable products to vendors at food festivals as well as promoting infrastructure for composting. Keep Knoxville Beautiful supports zero waste festivals and a family recycling challenge in the community. And Keep Cocke County Beautiful purchased a recycling trailer for proper disposal of recyclables in elementary schools and distribution of litter containers for cars at schools to lessen the amount of auto-generated litter. First Grade Students Learn to REUSE for Keep Columbus Beautiful First grade teacher Kelly Montgomery put a call in to Keep Columbus (Ohio) Beautiful’s Education Coordinator Stacy Law requesting a visit to her classroom to talk to students about litter prevention, graffiti abatement, how they can throw away less and how to help conserve resources by using the four R’s: reducing, reusing, recycling and rethinking. Montgomery spent time with the students explaining how important it is to reuse items such as egg cartons, plastic bottles, mayonnaise jars and more. Following the presentation, Montgomery gave her class an assignment—go home and locate an item the student thinks can be reused and develop a creative idea to use the item in a different way. The students were asked to write about their concept and bring in their project to share with the class. The students exceeded her expectations in presenting the reuse concepts to their classmates. One first grade student turned Styrofoam packaging from a wrapped meat package into a replica of a laptop computer! Another created a glittery pink jewelry case from an egg carton. A young fashion model on the runway during the Project GreenBerry “Trashion Show,” a collaborative service project of The Berry College Green Team and local schools. 10 million pounds of electronic wa s t e c o l l e c t e d .
Montgomery proudly put together a display of the items in the school hallway. Inspired, she called Keep Columbus Beautiful to ask if this display could travel for others to enjoy. Sherri Palmer, Keep Columbus Beautiful’s program manager, thought the city’s very “green” Mayor Michael B. Coleman would enjoy the students’ work. Mayor Coleman, whose Environmental Office developed a classroom program for first graders called “Green Spot for Kids,” did appreciate the project. So much so that it’s now on display in City Hall. For the 14th year in a row, Troy-Bilt continued its generous support of the Great American Cleanup (GAC) through its in-kind equipment donations to Keep America Beautiful affiliates and GAC participating organizations throughout the country. On the Great American Cleanup’s National Day of Action, Keep Oakland Beautiful utilized the straight shaft trimmer to cut down extensive grass and overgrowth in the Verdese Carter Park Community Garden, where 14 planter boxes were built and the garden was replanted and beautified. Volunteers also used the backpack blower to remove leaves and litter from over 33 blocks of the extra-wide Bancroft Avenue median, as well as for foliage and litter removal at Verdese Carter Park and East Oakland PRIDE Elementary School. The equipment will remain in Keep Oakland Beautiful’s tool lockup and be put to use at future events and cleanup efforts. Keep Norwalk (Conn.) Beautiful was extremely grateful to Troy-Bilt for the donation of a fourcycle backpack blower and the four-cycle string trimmer. Those Troy-Bilt machines are the only ones KNB uses for blowing accumulated litter and cutting back excessive weed growth in the town’s business centers. “KNB volunteers request the Troy-Bilt machines because they perform well and they know that they are better for the environment,” said Keep Norwalk Beautiful Executive Director David Shockley. The Troy-Bilt machines are also used to clean up neglected traffic islands, vacant lots and assist with community service crews when they tackle a disabled senior citizen’s yard. Gardens and Greenspaces Help Communities Flourish Natural beauty goes far beyond appearances; it creates vibrant communities, more robust economies, and even more healthy and happy residents. In 2012, beautification and greening activities included edible community gardens that helped feed the hungry and educate young gardeners. Multitudes of new tree plantings are providing shade, sequestering carbon and cleansing the air and soil. Flower gardens are creating vibrant gateways to downtown shopping and entertainment districts, forming vital places to live, work, shop and play. Beauty is, indeed, a powerful force. Keep Glendale Beautiful’s Children Grow Fostering sustainable behavior at an early age has always been a key component of Keep Glendale (Calif.) Beautiful’s outreach and education strategy. For almost 20 years, Keep Glendale Beautiful (KGB) has operated a successful in-school civic pride education program at the elementary school level. In recent years, a Junior Ambassador Program was implemented for the middle school level as the next step for students who “graduate” from the elementary school program. Students who participated in the Junior Ambassador Program expressed an interest in participating in an additional community program, the Monterey Eco-Community Gardens. Their desire to take the next step toward a sustainable lifestyle prompted KGB to create a student-run garden during the Great American Cleanup. During KGB’s 2012 Great American Cleanup, approximately 30 student and faculty volunteers from Wilson Middle School, as well as additional local volunteers, gathered on the school campus to build and plant the school’s new student garden. Volunteers spent approximately four hours building eight garden beds, which included beds for a variety of plants, vegetables, and herbs. Once the garden was completed, volunteers made the finishing touches by spreading mulch around the garden plots. In addition, students created a partnership with the school cafeteria staff to collect food scraps to be used for composting. Fort Knox Builds a Military Community Garden Through a Keep America Beautiful Lowe’s Community Improvement Grant Program, Kentucky Clean Community Program built a one-acre vegetable garden for the Fort Knox Military Community. The garden was planted on semi-established vegetation that had formally been mowed by landscape personnel at the military base. There were 220 volunteers who invested their time to permanently repurpose the land into a community garden. The project was inspired by the Governor’s Garden Initiative of Kentucky, which, in this case, brought together military families from several different neighborhoods who are living on the post. Many of these neighbors were not previously connected, as their service had separated them into different companies, battalions and brigades. The military community has a very special and unique culture and the garden project has provided a sense connection among those in the community. As a result of this program, military families have been introduced to gardening, fresh produce, environmental education and nutritional education. In addition, the garden program manager has reached out and connected with two on-post elementary schools and additional schools that are planning their own gardens for 2013. Keep Charlotte Beautiful Beautifies Girl Scout House As part of its Great American Cleanup effort, Keep Charlotte Beautiful (KCB) in Port Charlotte, Fla., restored the flower beds surrounding the Girl Scout House in honor of the 100th anniversary of the Girl Scouts of the USA. The house, a plain block building, serves more than 440 girls each year and needed some “sprucing up.” Local Girl Scout Troop 433 helped with the project by painting a rain barrel, which provides water for the plants and native species during the dry season. The troop also helped by planting and continued to water the plants often until they were established. Additionally, KCB provided the Girl Scout House with a cart filled with books, games and environmental activities. Keep Charlotte Beautiful believes that the garden will increase the Girl Scouts’ awareness of beautification, and the educational cart will provide them with plenty of fun and information to help earn badges for many girls in the years to come. Keep Houston Beautiful Day featured two major projects coordinated by the Greater East End Management District. Volunteers participated in the cleanup of Japhet Creek Green Finger Park, a natural stream that is the last tributary to Buffalo Bayou on the east side of downtown Houston. In addition, volunteers cleaned up historic Dawson-Lunnon Cemetery, situated in a 100-year-old African-American neighborhood for which a plaque is being sought from the Texas Historical Commission. Keep Houston Beautiful Day also featured a cleanup of the historic College Park Cemetery and a cleanup sponsored by the Woodcrest Neighborhood Civic Association near I-10 and Washington Avenue. Moreover, Worthing High School students and the City of Houston’s Department of Neighborhoods worked on curb painting as part of the Sunnyside project. Volunteers from Houston City Council District B and the Southwest Coalition of Neighborhoods conducted cleanups the following week, and Keep Houston Beautiful led a wide array of projects on Keep America Beautiful’s National Day of Action. Volunteers for the Hermann Park Conservancy planted trees, spanning an eight-acre area. “The Hermann Park Conservancy was the grateful recipient of almost 200 trees, which were much needed to replace trees lost to the 2011 summer drought,” said Barbara Jo Harwell, conservation director of HPC. “(It’s) an urban forest in the making!” The Museum Park Super Neighborhood cleaned up that area and mulched trees on the esplanades. And the Houston Museum of Natural Science Conservation Energy Club celebrated Earth Day by inviting organizations to host booths in its Grand Hall with activities to support learning about resource conservation and keeping Houston clean. Also on April 28, the Carverdale Civic Club with Waste Management sponsored a cleanup of R.L. and Cora Johnson Park. After a devastating tornado in February 2012, the residents of Harveyville, Kan., a small community located 45 miles southwest of Topeka, were in need of assistance. So Keep America Beautiful—Topeka/Shawnee County (KAB-TSC) took action by creating the “Re-plant, Re-paint, Rebuild, Renew Harveyville” project. “The damage to the community was severe with 60 percent of the residents having damage to some extent,” said Philicia McKee, executive director of KAB-TSC. Nearly 30 homes were no longer inhabitable and the tornado destroyed the town’s only church. Thanks to a Lowe’s Community Improvement Grant, KABTSC was able to develop a long-range plan to refurbish the community’s primary public facilities—the city’s park, ball field and City Hall—by the time its 75th Annual Harveyville Fair festival took place in September. “These are projects that would not have been completed without Lowe’s and our volunteers,” McKee said. Keep Guntersville Beautiful Recovers from 2011 Tornado On April 27, 2011, the area surrounding Guntersville, Ala., was hit by a horrible force of nature in the form of a tornado. Because of this terrible blow, the Guntersville community park, which is a key recreational area that serves as the heart of the community, was left as a physical and emotional reminder of the town’s loss. It’s estimated the park lost 50 trees and a great amount of vegetation; park benches and trash/recycling containers were destroyed; and the community suffered from the emotional trauma that such devastation can create. Through a KAB Lowe’s Community Improvement Grant, Keep Guntersville Beautiful was able to bring the community together and lift it from this awful destruction. Community volunteers and Lowe’s Heroes, Lowe’s employee volunteers, came together to install 12 benches, 19 trash receptacles and three recycling containers in the targeted area. More than 100 plants were installed to restore the beauty that the storm-damaged park previously had along the walking trail. In addition, Keep Guntersville Beautiful established a memorial Azalea Trail featuring 130 azaleas. The Azalea Trail serves a dual purpose of providing much-needed color to the park as well as a personal investment in and a special connection to the park for community members. On a cold, rainy morning in Springfield, Ohio, 86 intrepid volunteers worked tirelessly to beautify 30 blocks of the downtown business district as part of Keep Clarke County Beautiful’s 3rd Annual Great Downtown Cleanup. Volunteers ranged from elementary school students to Master Gardeners, who joined together to pick up litter, paint over graffiti, pull weeds, lay mulch, and sweep sidewalks. In total, the group contributed nearly 285 volunteer hours and picked up 3,150 pounds of litter from their business community. Tr e e sc a p e d b u si n e ss d is t ric t s av e r ag e 1 2 % high e r r e v e n u e t h a n t r e e l e ss a r e a s .
In a similar effort, Montgomery (Ala.) Clean City Commission rallied 100 volunteers who worked hard to beautify the Mulberry Business District. The Mulberry Business District is a heavily-traveled street in the heart of Montgomery with many quaint boutiques and eateries along the road. Volunteers picked up 2,000 pounds of litter, removed graffiti from an interstate underpass, built planters and planted flower beds. The area merchants also contributed enough money to purchase three custom iron signs that designated the district. The Dow Chemical Company demonstrated once again its commitment to making a difference in communities where it has a presence by nearly doubling the number of employee volunteers engaged in Great American Cleanup initiatives in 2012. In total, more than 1,000 Dow employees volunteered in 59 GAC events across 18 states. Events varied from cleanups to recycling initiatives to beautification and education activities. Moreover, in recognizing the importance of engaging and developing young people as environmental stewards, the company launched a pilot Dow College Cleanup Pilot Program. (See page 36.) Dow employees appreciated the expanded number and timing of the GAC projects, and felt that directing dollars to local events had a catalytic effect in participating communities. The City of Hayward, Calif., sponsored a citywide Keep Hayward Clean and Green event with the help of Dow employee Denise Berube. After Dow volunteers cleaned up South Hayward, they enjoyed a city-sponsored barbeque for the more than 400 volunteers who participated. Dow AgroSciences in Kaumakani, Hawaii, partnered with The Friends of Kamalani and Lydgate Park to clean up two sections of Ke Ala Hele Makalae in Lydgate Park. Volunteers cleared ironwood needles and 340 pounds of waterlogged driftwood from the Keiki Pond. Dow Chemical volunteers from the Ringwood, Ill., site, led by Cheryl Dawson and Karen Wilkins, worked in conjunction with the Fox Waterway Agency (FWA) to collect 500 pounds of trash and debris for the second year in a row. Volunteers worked along the roadway crossing the channel as well as from a barge provided by the FWA. Several people collected trash from small islands and wetlands in the lake area as well as along the shores of the channel between Petite Lake and Bluff Lake. Also in California, Dow Pittsburg Operations partnered with Keep Pittsburg (Calif.) Beautiful to clean up Kirker Creek, which runs along the Pittsburg-Antioch Highway. Volunteers removed three truckloads of trash from an illegal dump site and an additional two truckloads of trash from the creek bed. The majority of volunteers were students from Pittsburg High School. The Christina Conservancy partnered with Dow Electronic Materialsâ&#x20AC;&#x2122; employees from Newark, Del., to volunteer at the Christina River Watershed Cleanup. Approximately 800 community and corporate volunteers cleaned up nearly 20 tons of trash and other debris from along the Christina River and its tributaries. expressed gratitude for Dow’s support, commenting that the volunteer effort saved the YMCA 80 hours of paid labor. Haynes is looking forward to working with Dow employees again in the future. Houston Dow Center employees celebrated the week of Earth Day by participating in a week-long Electronics Recycling Event, sponsored by CORE (HDC building owner), with 16 Dow employees serving as volunteers. The collection was open to Dow employees, contractors and retirees. Volunteers assisted with unloading and packing items for recycling. Items were picked up by local electronics recycling company CompuCycle for sorting, recycling and/or proper disposal. Dow’s Houston Area Operations employees also volunteered at the Simms Bayou Trash Bash in doing their part. They also participated in the largest statewide event to educate the public about the importance of preserving water resources. In Lake Jackson, Texas, Dow employees partnered with Keep Lake Jackson Beautiful to pick up trash from various locations throughout the city that are notoriously littered. Volunteers were given red Dow volunteer shirts, heavy-duty work gloves, a trash grabber and plenty of trash bags. Some groups went to the historic downtown area; others went to major greenbelts in front of a local mall and strip shopping centers. By noon, the volunteers returned loads of trash back to the trash collection area at City Hall where there was celebratory luncheon. Dow employees volunteered in 59 GAC events. The Dow site in Port Lavaca, Texas, partnered with the Calhoun County Independent School District to sponsor an e-Recycle and Tire collection at the local Partners in Education Office. The collection was held in conjunction with the Grand Opening of the Dow Sustainability Education Center, an interactive environmental education center for students to learn about recycling. Educational Programs and Volunteering Energize Communities Volunteerism is at the heart of the American spirit. In 2012, 4.2 million volunteers and participants joined the Great American Cleanup, investing their time and passion in their communities. United in a common cause, people of all ages dedicated 7.9 million hours to efforts that improved their local surroundings and taught valuable lessons about the merit of taking responsibility for one’s community environment. School students also volunteered to help unload vehicles at a KLBB recycling event. The end result was 18,296 pounds of appliances, 24,347 pounds of electronics, and 1,178 pounds of batteries collected in one April morning. The results of the Ord High School Service Day Project were very visible to the community. And the students will have the opportunity to continue to volunteer for environmental projects through the school for years to come. Coordinated employee volunteerism programs have burgeoned as corporations have sought ways to engage their employees in corporate social responsibility initiatives. Numerous Phoenix-area corporations had contacted Keep Phoenix Beautiful (KPB) in the past few years seeking opportunities for their employees to get involved in local, environmental projects. As a result, in 2009 KPB developed “The Corporate Challenge,” which allows corporate volunteer groups to work on various project sites through a friendly, competitive framework. Once all the corporate groups were recruited and assembled, KPB worked with the City of Phoenix and the City of Tempe to determine and assign project sites. Each group had a diverse set of tasks to accomplish at a site, which might have included anything from planting trees to painting bleachers to removing trash or cleaning playground equipment. Some of the sites included the Arizona Audubon Center; a local nonprofit called Horses Help; many parks and elementary schools; a desert wash habitat; and a community garden. The final statistics demonstrated a high level of corporate involvement–a total of 445 volunteers worked at 14 project sites, contributing 1,780 hours to the community. Keep Phoenix Beautiful’s Corporate Challenge is a wonderfully unique event that brings together environmentally-committed companies, motivated volunteers and other nonprofit organizations, all with the common goal of making Phoenix more beautiful. The winning group received the Corporate Challenge Traveling Trophy to keep in its office for a year; the other participating companies received a plaque for participating. This year’s winner of the Corporate Challenge Traveling Trophy was Intel. Keep Lake Jackson Beautiful’s First “Servolution” For this year’s Great American Cleanup, Keep Lake Jackson (Texas) Beautiful (KLJB) conducted its first-ever “Servolution 2012” in collaboration with the Brazos Pointe Fellowship Church. On the morning of March 7, volunteers met at Brazos Pointe Church for a pep rally, followed by a Mayoral Proclamation. Once each person was assigned to his or her team and had supplies, the 1,000 eager volunteers marched out to the sound of the Buc Band’s music cheering them on. Keep Tularosa Beautiful Works Hard to Play Before Keep Tularosa (N.M.) Beautiful’s Great American Cleanup event, the families on the west side of Tularosa did not have a park or any recreational facility for their children to play. KTB’s community improvement project was to plant trees in several areas around the town’s Little League Field area that would provide shade and relief from the heat. In addition, KTB aspired to build a playground for the children to enjoy. Thanks to a Lowe’s Community Improvement Grant, KTB was able to make this dream come true by establishing The Happy Hearts and Helping Hands Park. Volunteers built and installed playground equipment including a swing set, teeter-totters, a climbing gym set with slides, and a merry-go-round. Volunteers also built and installed three picnic tables and four park benches in the park. The Happy Hearts and Helping Hands Park was constructed with the help of volunteers from the Holloman Air Force Base as well as others in the community. Additional services were provided by the Lowe’s Heroes, the volunteer corps from the local Lowe’s store, as well as other local businesses. The Happy Hearts and Helping Hands Park became a reality and put the “Unity in Community,” giving the citizens of Tularosa a much-needed recreational facility. The families that live on the west side of Tularosa and their friends now have a new park and playground that provides them a shady, safe environment to enjoy. These committed volunteers spent more than six hours completing 30 projects. Some of the projects included painting and cleaning at the Women’s Center, a creek cleanup project at the Gulf Coast Bird Observatory, cleaning and buffing the floor at the Thrift Store-Salvation Army, and painting signs at local fire stations. In addition to “Servolution 2012,” KLJB and Southern Brazoria County worked together with Dow Chemical for the Don’t Mess with Texas Trash-Off/ Great American Cleanup on April 14. During this event, all 347 volunteers plus KLJB Board Members collected 180 pounds of litter and 33 gallons of recyclables. A Paper Shredding program was also added to the event with great success. In just four hours, volunteers collected approximately 12,000 pounds of paper to be recycled! students participated. In working with the students, members of the Keep North Charleston Beautiful staff spoke with them about environmental issues. They also told them about Keep North Charleston Beautiful’s various programs, how they are conducted, where to get resources, and gave the students ideas about how they can get involved through their schools. Keep North Charleston Beautiful Executive Director Carmen Lane Hanlon explained that the relationships they are building with people and schools are very important. In addition, she is excited to have even more participants next year because children from the pre-schools want to get involved as well. Milwaukee Mayor Tom Barrett joins Auer Avenue School students for a Keep Greater Milwaukee Beautiful cleanup. Keep Bakersfield (Calif.) Beautiful (KBB) has made it a tradition for several thousand people to show their collective pride in their community through their annual Great American Cleanup Day. Volunteers for the local GAC are extremely committed and spirited. In fact, on April 14, more than 8,500 volunteers committed to the main event despite rain, mud and wind. Great American Cleanup National Sponsor Dow Chemical launched the Dow College Cleanup Program throughout midMichigan during this year’s GAC. The goal of the program is to engage college students with their local communities through the GAC and, in return, the student organizations receive a $500 project grant from Dow Chemical. The passel of volunteers cleaned up 201,780 pounds of litter and illegally dumped items, painted over 38,800 square feet of graffiti, recycled or composted 1,000 pounds of various compostable items, planted 120 trees, and beautified five sites, two of which will eventually become community gardens. Among the many students that volunteered were a number of collegiate athletes. Saginaw Valley State University Women’s Club Soccer Team members came out on a rainy Sunday afternoon to clean up a mile of the Bay City State Park shoreline. The Dow College Cleanup Program grant provided the team with money that they can use to purchase new uniforms and soccer gear. The team of 13 women divided and conquered different areas of the shore where they picked up trash, bottles and cans. Team members also got into a canoe to pick debris out of a lagoon. They then continued into the campground to tidy up the park by picking up sticks and branches, and raking out the flower beds to prepare them for spring planting. “We had the illegal dump sites getting cleaned up, about 100 trees planted and all the flowers going in. These projects last for a while and leave a nice impact on the area,” said Jessica Felix, community relations specialist for Keep Bakersfield Beautiful. From September through the end of June, 11,071 GAC volunteers cleaned up more than 255,000 pounds of litter and illegally dumped items, painted over 63,000 square feet of graffiti, recycled or composted nearly 140,000 pounds of food waste, planted 170 trees and 1,600 bulbs, flowers and shrubs, and beautified seven sites. Lasting change can happen when people work together, which has been in evidence with such a high level of dedication in Bakersfield. Volunteer Action Proves to be ‘Contagious’ Volunteers taking action in a wide array of springtime projects is one of the hallmarks of a successful local Great American Cleanup program. Keep Clark County Beautiful (KCCB) in Springfield, Ohio, was representative of the more than 38,000 different organizations that produced community-building events this year. Carly Woodrow, executive director of KCCB, reported that KCCB’s 2012 Great American Cleanup produced another year of great results. Nearly 1,900 volunteers participated, cleaning up and beautifying more than 100 public spaces through 4,000 hours of donated volunteer time. participants turned out to pick up litter, pull weeds and lay mulch, remove graffiti, collect dumped scrap tires and spruce up about 30 blocks of downtown Springfield during the 3rd Annual Downtown Cleanup in April. Students from Wittenberg University, Springfield High School, and the Ridgewood School painted over graffiti along the multi-use trails in four different locations during three separate paint-out events. There were 27,000 graffiti-laden sites that were removed or abated during the 2012 GAC. Beyond school groups, volunteers from various fraternal and environmental groups participated, including the Boy Scouts of America, the 4-H, the Kiwanis Club and the Greater Springfield Friends of the Trails, among others. These committed volunteers combined to collect more than 20 tons of litter and debris from March through May. *Based on reports from the participating organizations. Measuring Results State-by-State At the conclusion of their local activities, Great American Cleanup participating organizations are encouraged to provide a wrap-up report detailing the scope and diversity of their efforts. The following pages show their 2012 responses and provide an interesting snapshot of activities spanning the nation. Residential & Commercial Buildings Painted/Renovated/Built Graffiti Sites Removed or Abated Education Educational Workshops Educational Workshop Attendees (Adults/Children) General Awareness Events General Awareness Event Attendees RNA â&#x20AC;&#x201C; Report not available as of presstime. Education Educational Workshops Educational Workshop Attendees (Adults/Children) General Awareness Events General Awareness Event Attendees RNA â&#x20AC;&#x201C; Report not available as of presstime. Pilger Ravenna South Sioux City Middle School Southern Gage Community Pride Group Union Wauneta NEVADA City of Las Vegas Ward 1 Keep Truckee Meadows Beautiful National Park Service Lake Mead National Recreation Area NEW HAMPSHIRE Lancaster School Saint-Gaudens National Historic Site NEW JERSEY Beta Alpha Phi, Phi Theta Kappa, Hudson County Community College Woman’s Club of Arlington, EMD and The Junior Woman’s Club of Arlington NEW MEXICO New Mexico Clean & Beautiful Artesia Clean and Beautiful Farmington Clean & Beautiful Hobbs Beautiful Keep Alamogordo Beautiful Keep Albuquerque Beautiful Keep Carlsbad Beautiful Keep Clovis Beautiful Keep Dona Ana County Beautiful Keep Las Cruces Beautiful Keep Las Vegas Beautiful Keep Luna County Beautiful Keep Rio Rancho Beautiful Keep Roswell Beautiful Keep Ruidoso Downs Beautiful Keep Santa Fe Beautiful Keep Tularosa Beautiful Keep Valencia County Beautiful Village of Ruidoso NEW YORK Glen Cove Beautification Commission and Litter Prevention Program Keep Brookhaven Beautiful Keep Islip Beautiful Keep New York City Beautiful Keep Rockland Beautiful Keep Western New York Beautiful Niagara Falls Fire Dept. Rome Clean and Green NORTH CAROLINA Keep NC Beautiful Asheville GreenWorks Clear Channel High Point Keep America Beautiful Keep America Beautiful of Nash/ Edgecombe Co.
Keep America Beautiful would like to extend its thanks to all of the executive directors, staff and volunteers of the KAB affiliates and Great American Cleanup participating organizations as well as National Sponsors and Promotional, Educational and Retail Partners, for their unique contributions to the Great American Cleanup and for contributing to this annual report. We couldn’t have done it without you! As a 13-year sponsor, Wrigley, a subsidiary of Mars, Inc., provided in-kind product donations to attendees of litter prevention education workshops in connection with the Great American Cleanup events. LG Electronics USA helped bolster the Great American Cleanup’s electronics recycling results through LG’s nationwide e-cycling program, including innovative programs during March Madness® and the NCAA® Final Four® in New Orleans, in partnership with WM Recycle America. From the dawn of Keep America Beautiful’s national cleanup events, The Glad Products Company has continued its support of KAB’s mission. For 27 years, Glad has supported cleanups by donating over 2.5 million GLAD® trash bags to organizations nationwide. Our volunteers could not clean up their communities without them. Troy-Bilt® Lawn and Garden Equipment, for the 14th year, continued its in-kind support by donating equipment upon request to local organizations for their community improvement activities. The donated equipment will continue to be used in the selected communities long after the cleanups and green-ups have ended. In its 14 year of sponsorship, Pepsi-Cola Company once again donated soft drinks to help quench the thirst of volunteers at hundreds of events nationwide. The company also played an invaluable role in rallying volunteers, producing and distributing event posters promoting the “Green Starts Here” campaign. Program posters for organizations nationwide were graciously shipped by the Pepsi-Cola Company as well. Waste Management (WM) has supported the GAC for the past 10 years. More than 100 local KAB affiliates have benefited from WM volunteer efforts. WM also provides essential environmental services such as recycling and waste disposal that helps communities remain clean and beautiful across the nation. In 2012, WM supported community improvement projects for 15 KAB affiliates through the WM/GAC Think Green® Community Improvement Grants. In addition to providing funding through their generous national sponsorship donations, the 2012 Great American Cleanup Category Exclusive National Sponsors leveraged their partnership with Keep America Beautiful through activation programs. Nestlé® Pure Life® Purified Water was a National Sponsor of the GAC for the third year. The top 25 state and local affiliates that collected the most PET bottles for recycling were awarded $1,000 each for a Nestlé® Pure Life® PET Recycling Award. Nestlé Waters also provided over 2 million bottles of water to keep busy volunteers hydrated. For the fifth consecutive year, The Dow Chemical Company marshaled its employees to participate in 59 service projects including “trash bashes,” hazardous material collections, river, beach and bayou cleanups, tree and flower planting, invasive plant removal and recycling programs nationwide. Dow also piloted the “Dow College Cleanup Program” to engage college students in mid-Michigan to improve their communities. Grants to local KAB affiliates and like-minded organizations further supported Dow’s commitment. Returning as a fourth-year sponsor, Solo Cup Company provided grants to KAB affiliates for grassroots education about the proper disposal of foodservice packaging. In addition, Solo donated Bare™ by Solo® cups and plates–made with renewable and recycled materials–to affiliates across the country, providing an environmentally preferable alternative to traditional singleuse food service products. Hundreds of Solo volunteers also created and implemented community improvement events near a number of its facilities. Contact your local sanitation or public works department. They can advise you on the special trash bags or receptacles you may need, provide hauling services for bulk items or from illegal dump sites, and any other special requirements. And be sure to speak with your elected leaders about your plans—they can be great allies. The Great American Cleanup offers volunteer opportunities for concerned individuals, schools, community or church groups, or even local businesses to take control of their local environment, take action, and get involved. If you don’t have a local KAB affiliate or participating organization near you, here are a few steps to help you get started with your own activity or event. Contact your local KAB affiliate or participating organization to find out dates, locations and details for local events. A full listing of organizations can be found at www.kab.org. Organize a cleanup committee by seeking out a few people who share your passion for the cause. Set a meeting date and let the ideas flow. Decide which project your group wants to tackle, and define responsibilities. Set dates for your activities. Saturday mornings are often best, with an alternate rain date scheduled for the following weekend. Make sure your event doesn’t conflict with other major happenings or events in the community, especially ones that involve volunteers. To register your event, email gac@kab.org and tell us your plans. Event registrants can access an online Program Kit with lots of useful resources and tips, marketing materials and more. You may be eligible for receiving other in-kind support as well. Turn to local business owners and your local chamber of commerce to support your efforts. Ask them to donate supplies, tools or refreshments, and to help you promote the event to their employees, members or customers. Reach out to potential allies like scout troops, environmental clubs, church groups and other community organizations, and enlist their help. Use Great American Cleanup promotional tools like posters, banners and press releases to promote your event. Contact local media and make them aware of your plans. Make a checklist of the equipment you will need, permits and permissions required, and other important concerns. Make sure your volunteers know what equipment to bring, and encourage them to be prepared for the weather conditions by bringing sunscreen, hydration and the appropriate clothing for your project. Celebrate your achievements and say “thanks” to your volunteers and partners for a job well done. Consider hosting a picnic or “thank you” celebration after your activities are completed, and include local officials and others who helped you along the way. You can also find out more information about Keep America Beautiful and the services and programs it provides by visiting its Web site at www.kab.org.